Is the Super Squish pouch strong enough to contain food on the go? Is the Super Squish pouch made from food grade materials? Definitely – the pouches are made from food grade plastic and comply with the required EU standards for these type of food pouches, specifically those that are designed to be used by infants. Using the pouch is as simple as ‘Refuel, Zip & Zoom’: REFUEL – Pour in your blended food, ZIP – close the zipper seal and ZOOM – off you go! 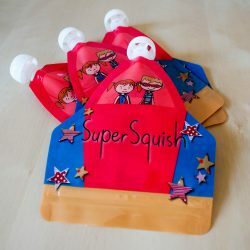 What can I put in my Super Squish food pouch? You can fill the pouch with any food that is pureed or blended, with bits that are no bigger than the spout opening. It’s best to avoid very runny liquids, such as juice or water, but anything with a thicker yoghurt-like consistency will work. Do not put hot foods into the pouch but allow them to cool before you fill. TIP: For weaning BABIES – you can fill up the pouch with the required amount of puree or if you’re using puree frozen in ice cubes, you can pop a few in the pouch, let them defrost and go. Read the Super Squish and early stage weaning blog post for more details. If you’re using the pouches for BIGGER KIDS, smoothies are definitely a favourite filler. Have a look at our recipes for some inspiration! Can I heat food up in the Super Squish pouch in the microwave? NEVER heat up the pouch and contents in the microwave. Instead, put the pouch in hot water to heat up the contents or defrost the contents. Who can use the Super Squish pouch? Anyone! These versatile reusable food pouches can be used as part of the weaning process right through to being a lunch box filler for older children at primary school. TIP: Fill the pouch with smoothie mixture and freeze. Remove from the freezer in the morning and put in your child’s lunchbox wrapped in a dishcloth/ fabric napkin. It will be nice and slushy by the time they eat it! How do I open my Super Squish pouch? Turn the pouch upside down so that the spout is at the bottom. Put your thumbs into the centre of the opening and grip each tab as close to the seal as you can. This will also help to extend the life of the seal on the pouch. Firmly pull the tabs away from each other. The seal will open and you can pour or spoon food into the pouch. You should get lots of use out of the pouch, if you look after it properly and treat it with care by following the instructions on this page. Unfortunately, like a lot of good things the pouch won’t last forever. Realistically, you can expect each pouch to last a few months with constant use and the associated wear and tear. At this point, you can recycle the pouch with your plastics. In the unlikely event of the zipper seal on the pouch breaking after only a few uses, please contact us. How do I fill and close my Super Squish pouch? Before you first use your pouch, it is best to wash it out with warm soapy water. Turn the pouch upside down and make sure that the cap is firmly screwed on. Open the pouch and fill with your favourite blended food. To seal the pouch, start at one end and press the seals firmly together. Slide your fingers along the seal. You should feel the zipper seal closing. Repeat this a few times to make sure the seal is completely closed. How much food can I put in my Super Squish pouch? The pouch will hold up to about 150ml of pureed or blended food. Typically, only fill pouches with about 130ml if they are going in the freezer, as the pouch contents will expand on freezing. An easy way to help you know when to stop filling, is to fill the pouch to about three quarters full or allow about 1.5cm gap between the food and the top of the pouch. How do I clean my Super Squish pouch? The pouch can be cleaned in warm soapy water or in the top rack of the dishwasher. You might need to drop the top rack to allow thorough cleaning! While the rounded internal edges of the pouch make it unlikely that food will get trapped inside it, from time to time it might be necessary to use a thin bottle brush or the back of a knife/fork/spoon to get rid of any stubborn pieces! To sterilise the pouch you can use a tablet or liquid steriliser such as Milton or a steam steriliser. If using a steam steriliser, make sure that the pouch is opened properly while sterilising to ensure the steam can flow all the way through. TIP: To make cleaning even easier, give the pouch a quick rinse immediately after use. How do I defrost my Super Squish pouch? To defrost a frozen food pouch, either immerse the pouch in a bowl/sink of warm water, defrost overnight in the fridge or defrost at room temperature. NEVER place the pouch containing food in the microwave to heat it up! What happens if I lose a cap? 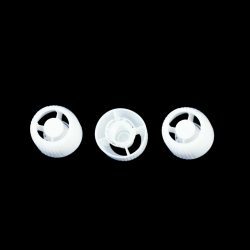 We understand that the little caps are easy to misplace and that is why we include a spare replacement cap with every order! However, if you need more you can order a pack of 3 replacement caps from us. Alternatively, the caps on most pre-filled pouches should fit the pouches.